Deciding to propose and therefore looking to buy an engagement ring is an exciting prospect but can also be daunting. Before you head out to buy the first ring that you see, you need to do your research; gain an insight by window shopping, learn what style your partner prefers and set a budget that works for you. Fine jewellery, and in particular diamonds, have a close association with timeless love and romance. We know how overwhelming and frustrating it can be to source a piece that perfectly meets your requirements, so we have put together an easy to follow plan for purchasing an engagement ring. 1. Always start with your budget. Set one that you are comfortable with and no, you do not have to adhere to the monthly salary ratio notion! Make it affordable knowing that your partner will love it for many years to come. You may decide to save some of your budget for wedding rings and other bridal jewellery for the day. 2. Understand your partner’s current likes. This means doing some in-house research! What do they currently wear? Is it classic and contemporary or vintage? Would they prefer diamonds, be it a single solitaire or maybe a trilogy setting, or perhaps a coloured gem such as ruby, sapphire or emerald? Is 18k yellow or white gold preferable, or maybe platinum? 3. Work your knowledge base! Understand from all your partner’s friends, colleagues and family what your partner likes. This can be done with them knowing you are looking to propose (providing they can be trusted to keep it quiet!) or by being subtle with questions. Has your partner provided any hints, or do they have to have a specific designer brand they are particularly fond of? 4. Understand what determines value. If diamonds are the choice, then having an understanding of how diamonds are graded and therefore valued is very useful. This is determined by the famous ‘4 Cs’; cut, clarity, colour and carat. 5. Consider the metal type and setting. Again, consider what your partner likes.In terms of metal, would your partner prefer a classic yellow gold style that was popular in the Victorian times, or the 18k white gold or platinum modern day favourite? For the setting, understand if the classic solitaire would deliver the wow factor, or perhaps a halo ring with numerous smaller diamonds circling a central diamond could work well. 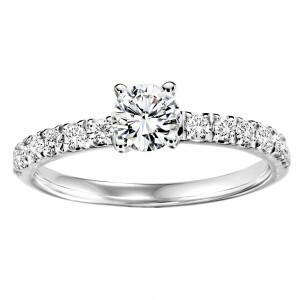 Follow each step by completing your own research and you will be on the right track to sourcing an engagement ring. If you are struggling with styles, shapes or even the terminology, seek professional advice. Tweet us at @NJGJewellery or email neil@njgeddes.com to arrange a private appointment.